Authentic South Texas Tamales - Happy Little Momma | Faith. Family. Writing. Authentic TexMex is a strange and not very specific description. After all, El Paso TexMex can be quite different from Hidalgo TexMex and Laredo TexMex. Just what is TexMex anyway? My best guess is that it’s a Texan/Mexican hybrid of deliciousness that qualifies as neither authentic Texan nor authentic Mexican but is yummy-licious in it’s own right. That is right smack dab where Delia’s tamales wind up. If you ever find yourself in the Rio Grande Valley and are interested in authentic South Texas tamales – the kind I grew up with – you have to visit Delia’s. 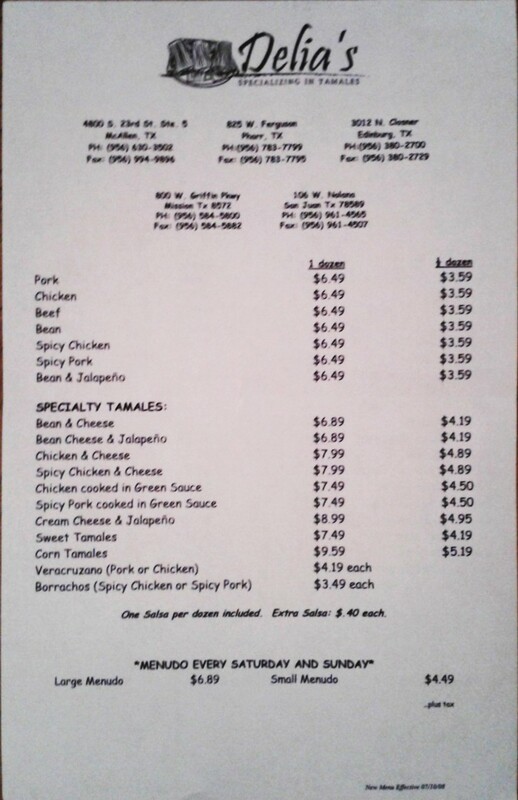 Delia’s has 18 tamale varieties (including a few dirty vegetarian ones) and 5 upper Valley locations: Edinburg, McAllen, Mission, Pharr, and San Juan. A vegetarian dish that may (or may not) have been cooked after a meat dish and/or with an ingredient that would add a meat base or flavor (like lard or broth). [/su_pullquote]The prices at Delia’s are reasonable, you can dine in or carry out, and the tamales are as pretty as they are delectable. There’s no masa (dough) overflow to impeed the removal of the corn leaf. The naked tamale is perfectly formed, not lumpy. The ingredients are well mixed and the spices are just right. Heck, my Mom picked up 3 dozen tamales last night for her, my son, and I to share. There are none left as I write this.